The social media landscape evolves at lightning speed. It has also become increasingly cluttered with countless platforms and a million voices. This makes it difficult for small businesses to keep up with trends and establish a solid digital brand. 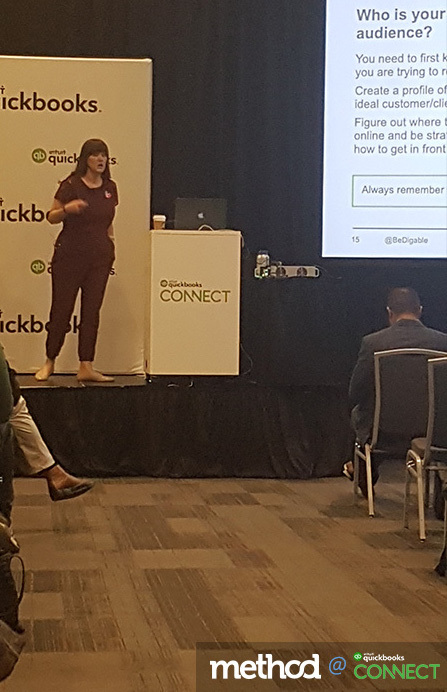 Sometimes, you just need an expert to give you some actionable pointers — and that’s exactly what QuickBooks Connect attendees got at Lindsay Williams’ talk. “I look at the first Grammys I was working in 2012 and I think, man, it was a simpler time,” said Williams, who has 10 years of digital marketing experience in the music industry. She’s also the founder of Be Digable, a firm that helps female executives develop their personal brands. Williams acknowledged that even she feels overwhelmed by all of the new platforms and features, so she can’t imagine what it’s like for those who are less familiar with social media. Nevertheless, her goal was for attendees to leave the session feeling inspired and empowered. To start off, Williams introduced the three keys to nurturing your online brand: consistency, storytelling, and authenticity. Then it was time to dive into each one in detail. Anything worth doing needs to be done right — and that rule definitely applies to social media. The first thing you need to do is commit to a consistent posting schedule. With social media, there isn’t necessarily an immediate payoff. It’s easy to procrastinate and think you’ll get to it later. But the truth is that you have to prioritize your posting times so you don’t fall behind. As you build a following, they’ll come to depend on your consistent content. Not meeting that expectation creates a negative impression of your brand. “If I discover a new business, the first thing I do is go to their social media,” said Williams. If she sees that they haven’t posted in a few weeks, she loses a bit of respect for them. Williams offered some tips for maintaining a consistent posting schedule. A lot of business owners think they need to be on every platform. But then they get overwhelmed — “and all of a sudden, you’re on six different platforms and you’re doing none of them well.” Instead, carefully choose which platforms to cultivate. A good rule of thumb is to focus on two platforms at first, then expand to others if desired. It’s a good idea to maintain branded accounts on other platforms in case your target customers are searching for you there. Keep your bios up-to-date and include links to the social media accounts where you are posting current content. At the beginning of the year, look through your calendar of events and develop a strategy for posting on social media. Then, make sure you revisit your strategy at the beginning of every month. This will keep you on track and allow you to add or revise things if your priorities have changed. “It’s such a simple concept — and mind-blowing all at the same time,” said Williams. While social media posts may not seem like they should take much time, the truth is that posting regularly involves a good amount of work. To keep your content strategy focused, set aside 30 minutes each week and one day each quarter to develop and schedule future posts. Photos are an important aspect of posting to social media. Of course, you don’t want to accidentally infringe on someone else’s copyright, so it’s important that you own the rights to the images you use. Hiring a professional photographer for a few hours can give you several months’ worth of photos to use in your posts. Storytelling: What Do I Post? Storytelling refers to how you present your brand on your social media channels. Think about what is most important for your customers to know. How do you want them to view your brand? What makes you different from your competitors? This is your narrative and it should be the underlying theme in each of your posts. “You probably assume that your customers already understand the passion behind what you’re doing — but they probably don’t. You have to reinforce it over and over again,” explained Williams. It’s like talking to a person — most people don’t say one thing and then say something completely contradictory the next day. You can switch up the wording and content of your posts, but you should always maintain a consistent personality for your brand. Williams provided some tips for emphasizing your narrative. Followers who have been with you for a while might understand your mission, but new followers will base their understanding on your most recent posts. Sharing micro-stories about your brand on a regular basis gives you a chance to reinforce customer loyalty while building new relationships. “I’m not going to hate on a great Instagram photo,” said Williams — but don’t let getting a perfect image take priority over sharing your message. The story comes first. While it’s important to post on a regular basis, that doesn’t mean you can forego quality for quantity. You want each post to be representative of your brand. Remember, new followers will see only your latest posts before they click the follow button — or click away. If you always knock it out of the park, you’ll be more likely to attract attention from your target market. A lot of the content you create will always be relevant, no matter the season. If you have a high-quality post that gets a ton of interest, re-purpose it for future use instead of constantly trying to develop new content. Authenticity: How Do I Gain Followers? “This is my least favorite question of all time,” admitted Williams. Everyone wants a million followers — but the truth is that having a million passive followers doesn’t do much for you. What does help? Having a strong community of followers who consistently engage with your brand. Engagement is the key metric you’re looking for on social media, and you get that by being authentic in your posts. So how do you maintain your authenticity and attract the right followers? This can take some time and you may have more than one type of ideal follower. But it helps you tailor your messages if you know exactly who you’re speaking to. It’s also helpful to create a customer persona (or several) that gives you a concrete example of the person your posts are trying to attract. Consider where this person lives, what they do, and what their interests are. Some demographic groups tend to use certain social platforms more than others. Use this information to develop the right strategy to reach your target audience. Remember, you don’t need to be highly active on every platform from the get-go. “In order for your customers to feel like you relate to them, you have to authentically engage with your community,” advised Williams. This means following relevant hashtags and interacting with posts from other accounts that have similar followers to your target demographic. In doing so, you will become a genuine participant in the conversation, rather than a brand that’s purely on social media to shout your own message. 82% of consumers are more likely to trust a brand when they can find and engage with its leadership on social media. Of course, this doesn’t mean you have to open up your private Facebook profile to the world. But if you’re already publicly active on some platforms, leverage those opportunities to share your company’s story with your followers. 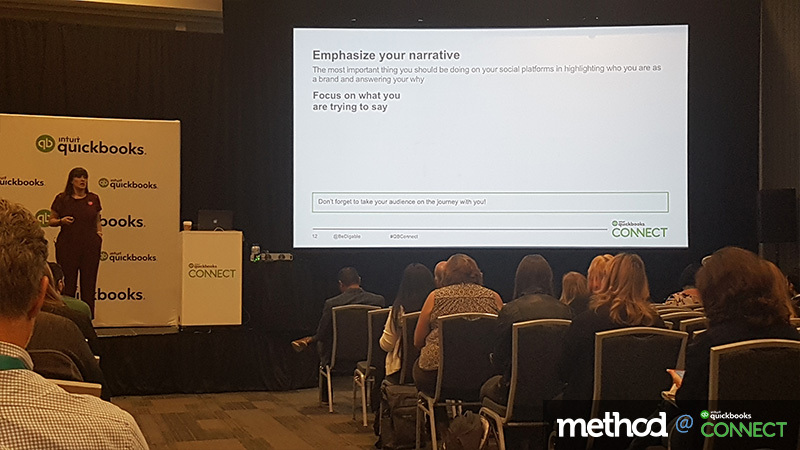 Want more #QBConnect content? 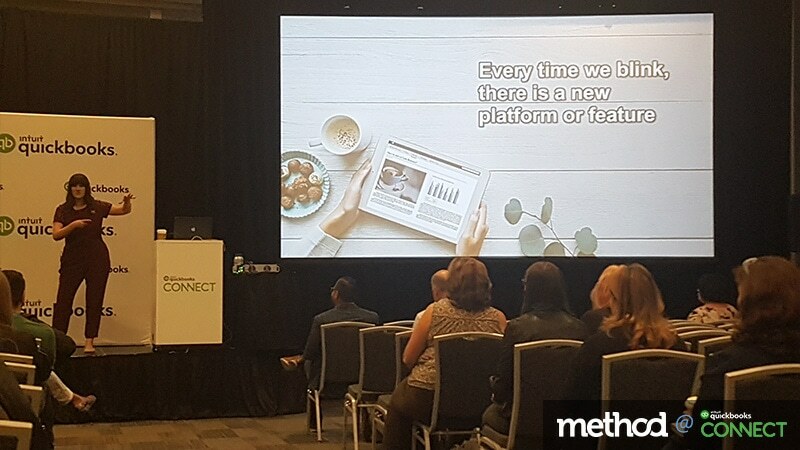 Check out our full coverage of QuickBooks Connect San Jose 2018!